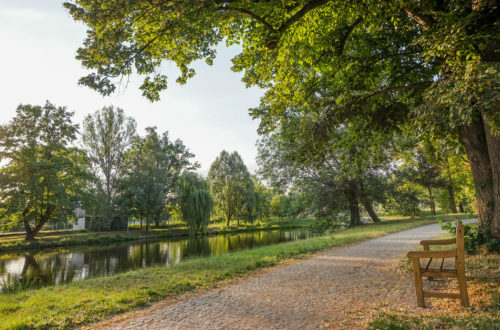 First of all, it’s important to mention that Kampa island is an artificial island surrounded by the Vltava river and Čertovka (Devil’s Stream). 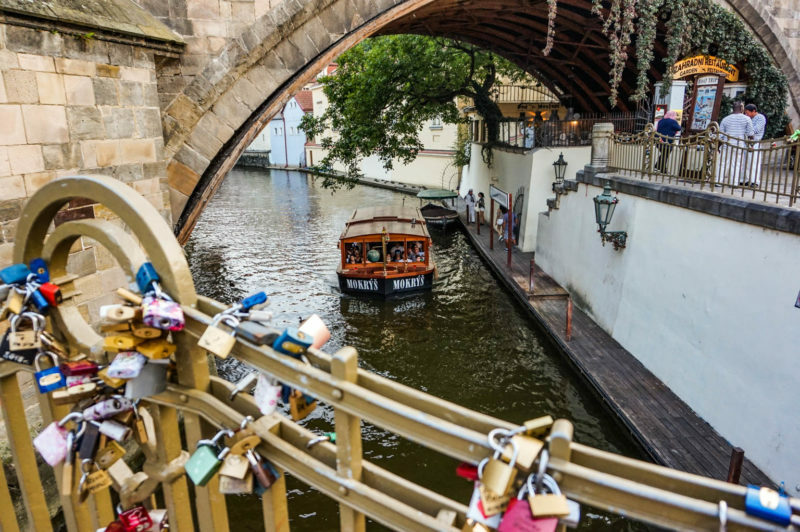 This stream creates a picturesque atmosphere that is also called a Prague Venice. I start the walk just a little bit out of the island, at Malostranská tram station where I continued under the Manesuv bridge. 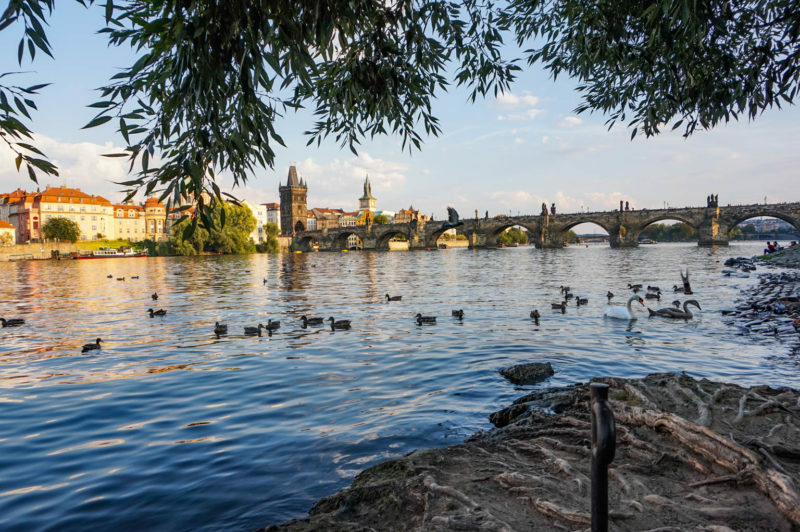 There is a small beach with ducks and swans, and a wonderful view of the Charles Bridge. It’s an amazingly photogenic place that you really must experience by yourself. It’s even worthwhile to climb the steep stones on the right side and sit privately on the stones, enjoying the view of the river. 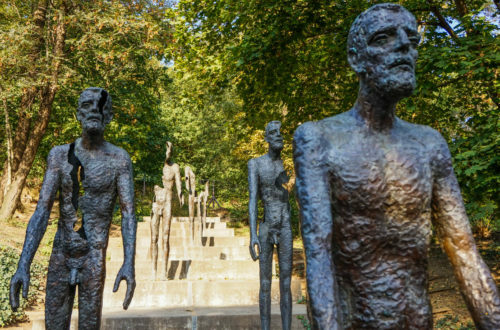 Then I continued to Hergetova cihelna courtyard, where you can find Franz Kafka Museum and striking statues of two urinating men. 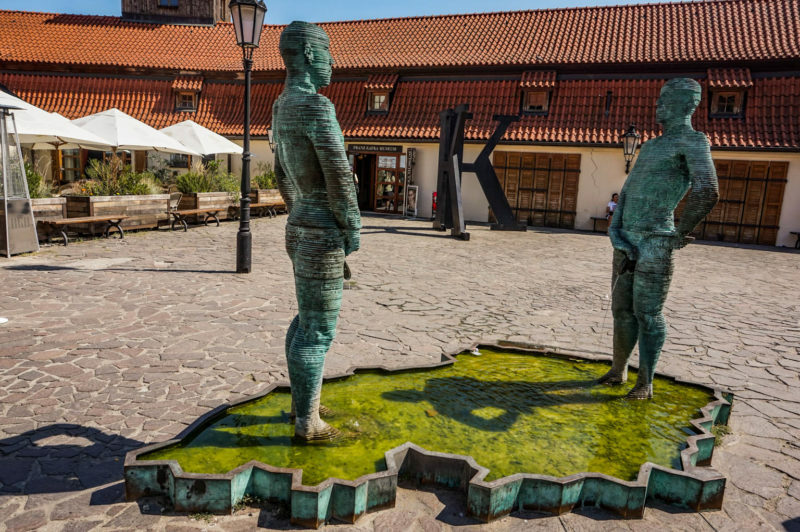 The author David Černý (famous for his controversial Entropa sculpture) displayed two men urinating on the Czech Republic. Just behind this statue is a Franz Kafka museum, that present his life in Prague and displays some of the original manuscripts and letters. If you are fun of Kafka as I am, you will like the exhibition. 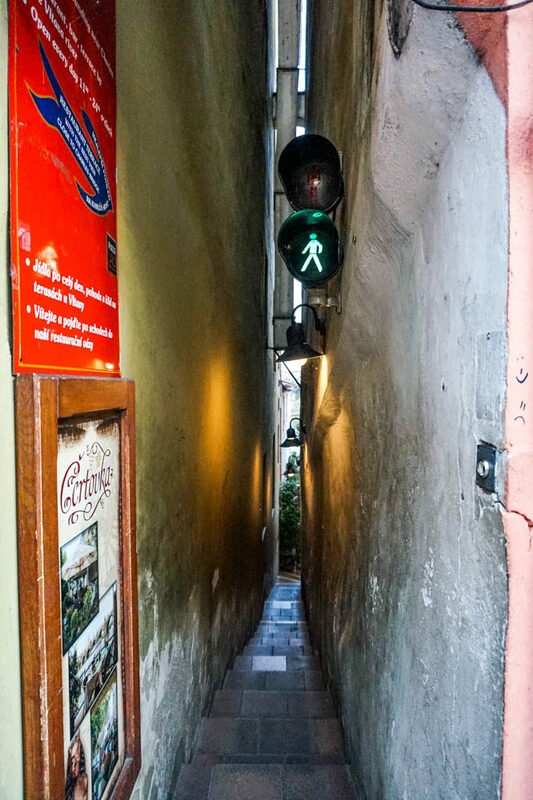 Continuing to the small square, you will find the narrowest street in Prague. 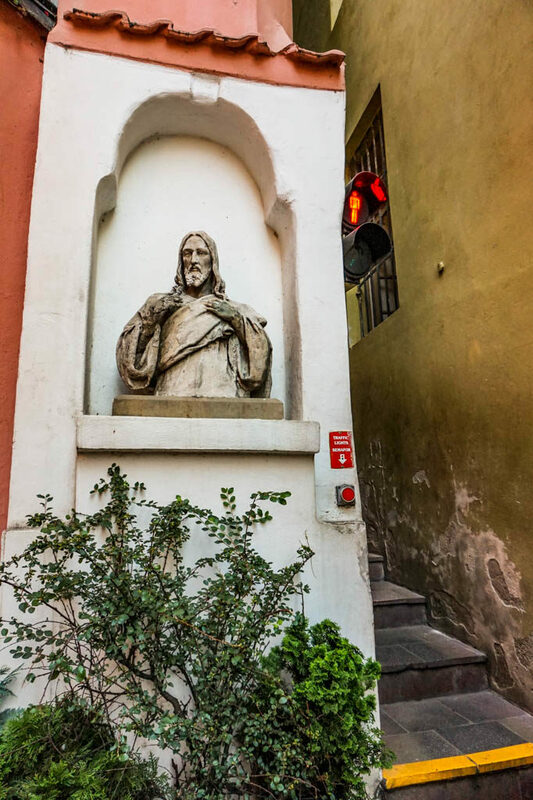 If you want to pass through it, follow the traffic light of green or red. Otherwise, you would not fit with people coming from the opposite side. 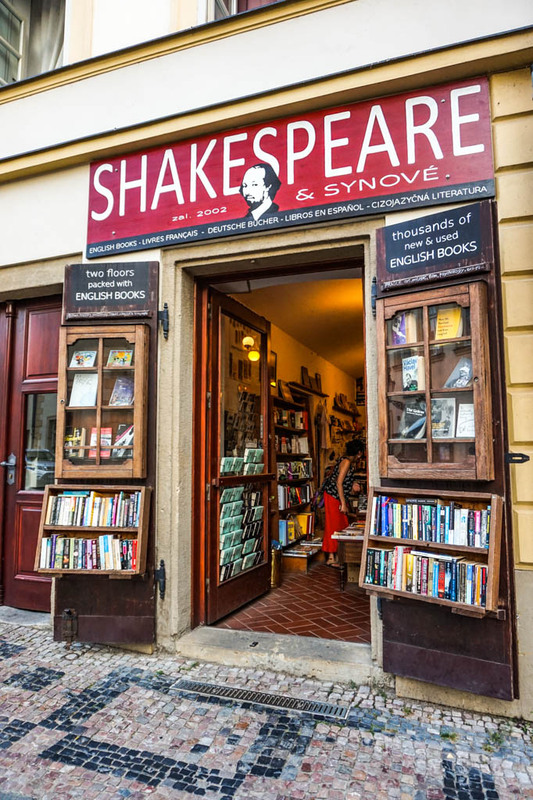 Further on the square is a great English bookshop Shakespeare and Sons with an interesting choice of books, that you can even check here. If you go a little bit back by the street U Lužického semináře, you will find the entrance to the Vojan Gardens. Since this park is not on the touristic route, not many people know about it. So, it’s usually almost empty and you can enjoy a relaxing time in a calm atmosphere. Then I continued back to the small square and further until I reached the Charles bridge. 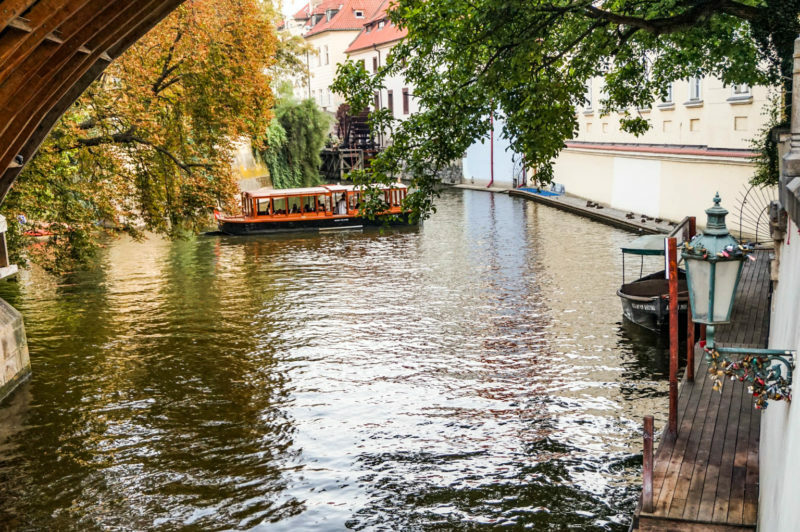 This is the beginning of the Kampa island where you can see small boats on the canal. 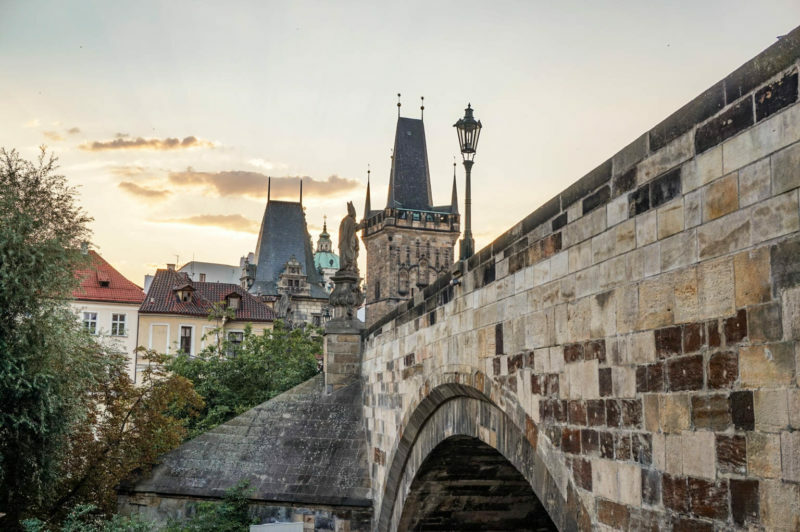 The area under the Charles bridge is just beautiful. 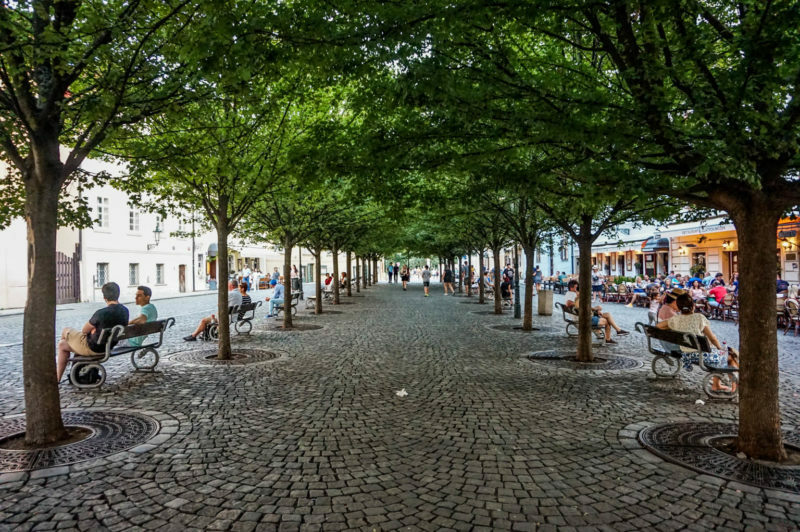 Then I continued under the bridge to the Kampa square with plenty of trees, benches, and restaurants. 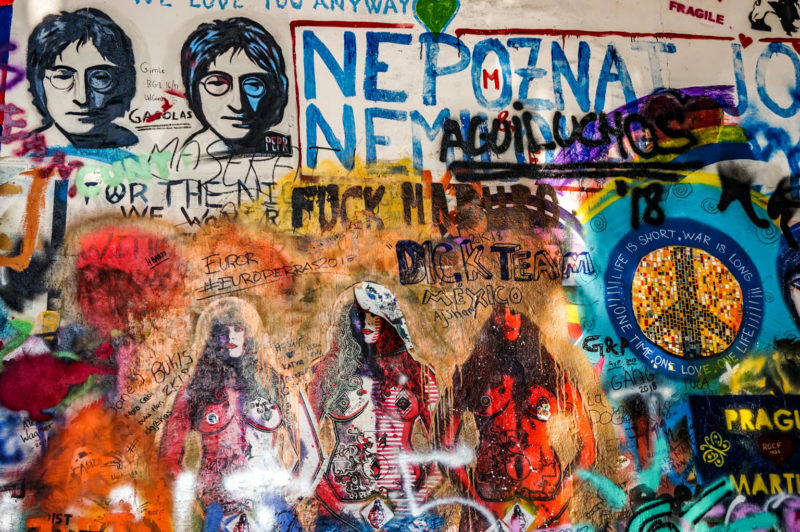 Take a first street right and you will reach the John Lennon wall soon. After the death of Lennon in 1980, an anonymous person wrote a message “for John Lennon” that was considered as the rebellion by the communist regime. It became a symbolic gravestone where people bring candles and flowers. 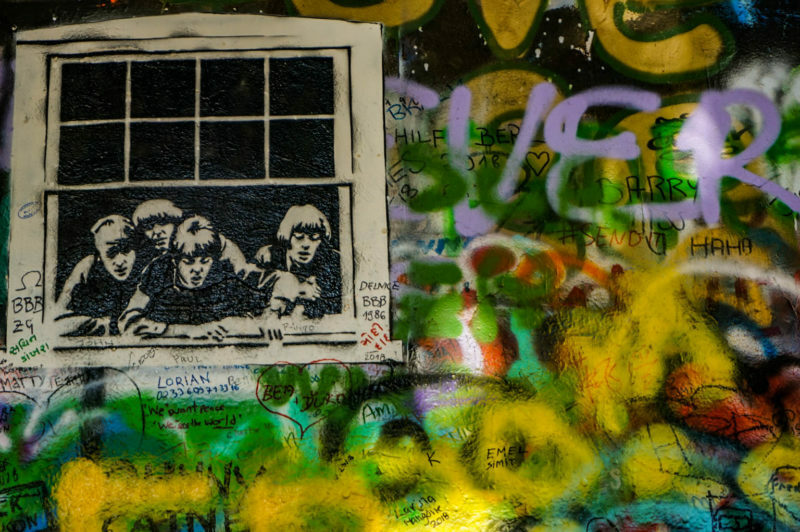 Soon, people used the wall for graffiti inspired by the texts of his songs about world peace, and soon slogans criticizing the totalitarian regime began to appear. The wall was several times repainted, so you won’t find original paintings here. 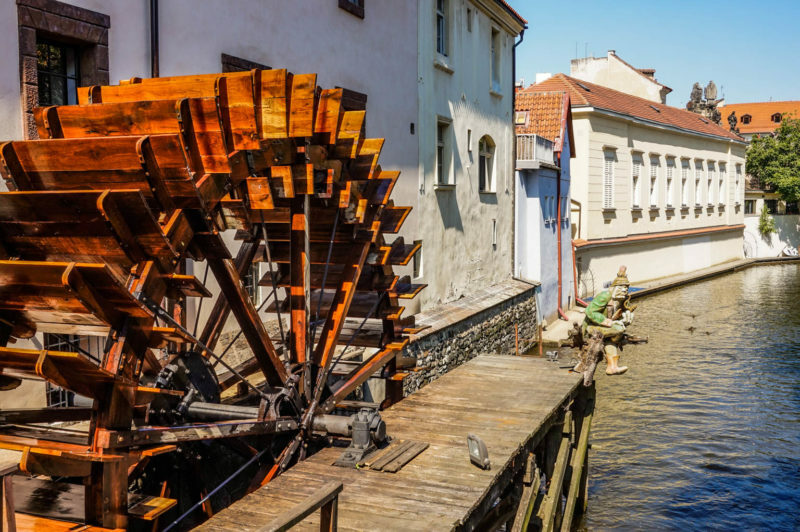 Walking back to the Kampa, you will cross a small bridge with a view of the largest milling wheal in Europe. 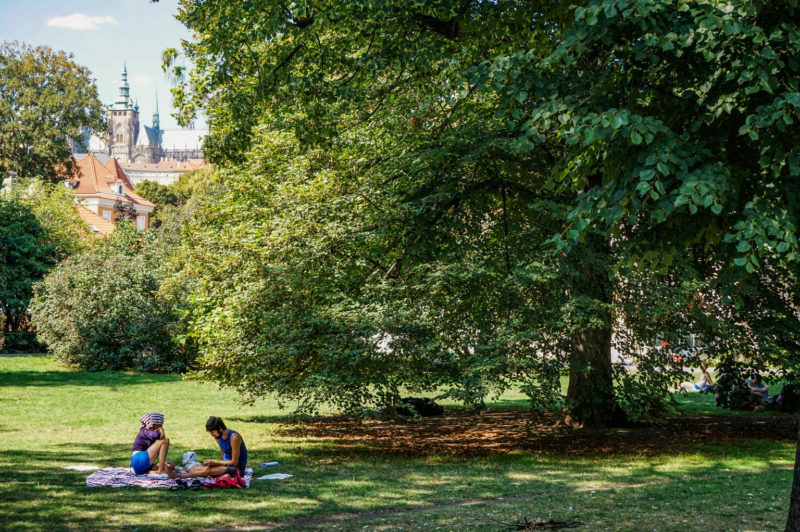 Back to the Kampa, you will reach the Kampa park soon. 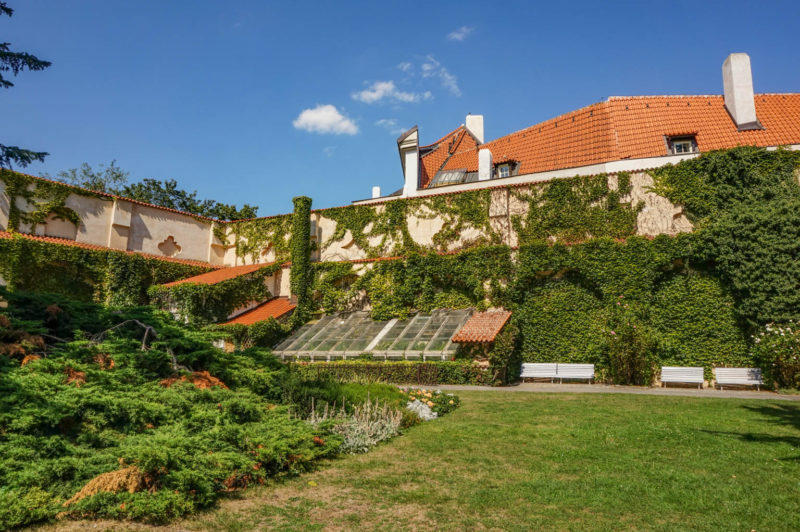 At the beginning is newly a renovated Werichova villa with a museum and phenomenal If Café with delicious Czech sweets. 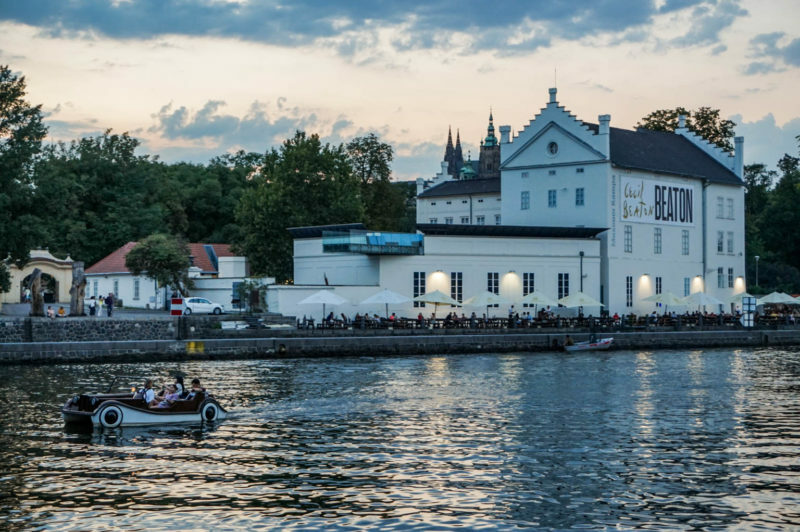 Continuing on the left side of the island, you will see the former mill that is turned into the Kampa Museum. 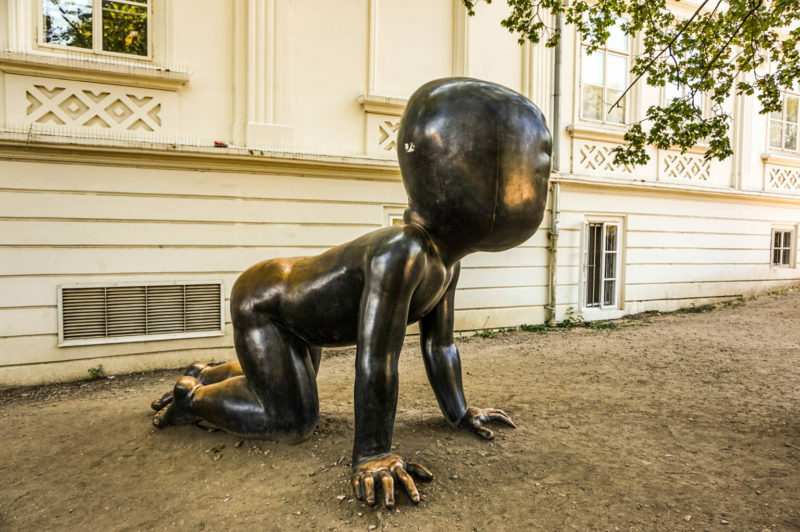 Just in front of it, you will find three giant babies that are also created by David Černý (author of two urinating men at the beginning of our walk). 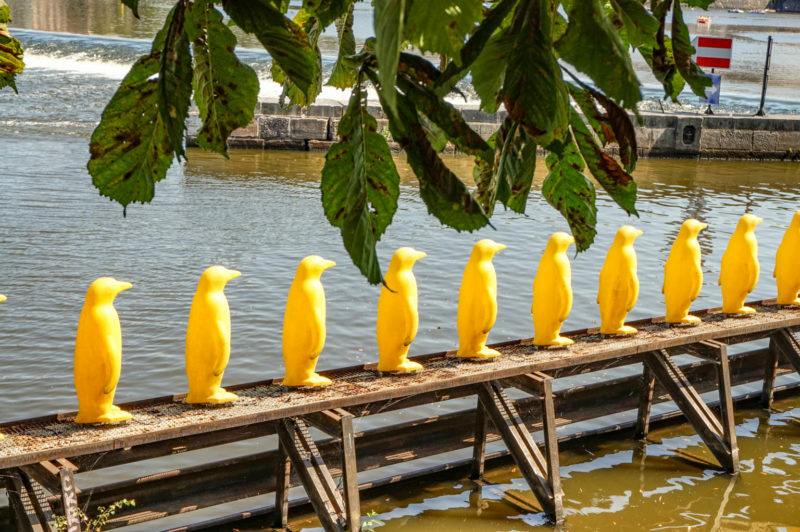 Enjoy the view of the river again where you will find a row of yellow penguins. 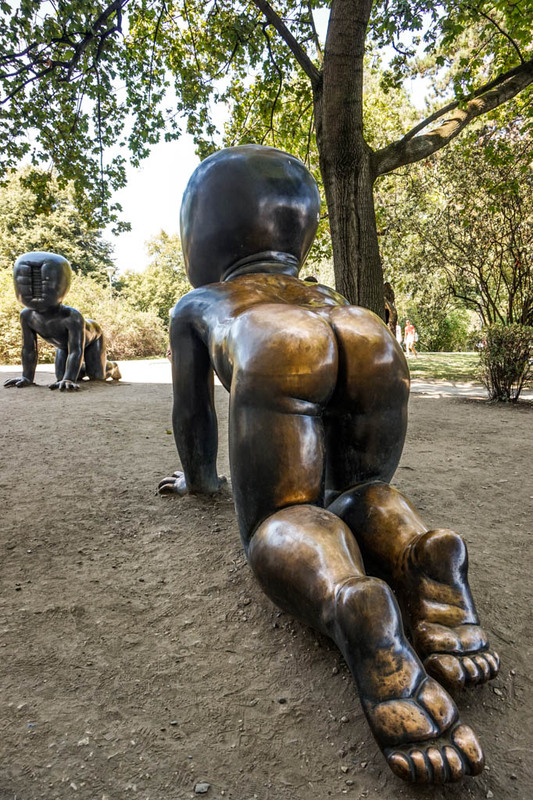 Kampa Museum itself offers a permanent exhibition of famous Czech artists with very interesting temporary exhibitions. Check the actual program here. I really like Kampa Park itself, with greenery and huge trees. You can have a rest in their shades and enjoy a picnic with your friends. I like to grab some drink in nearby Mlýnská café and hang out outside. 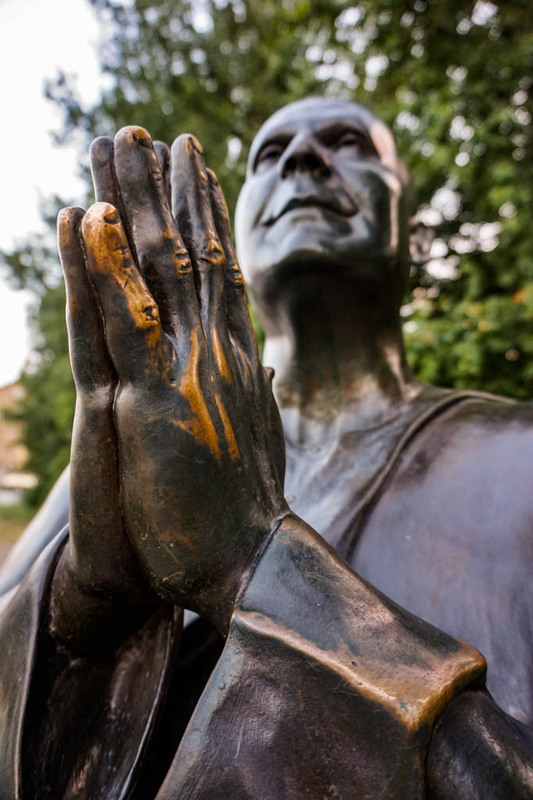 At the very end of the island, don’t forget to visit a statue of the praying man that you will find on the left side by the Vltava river. 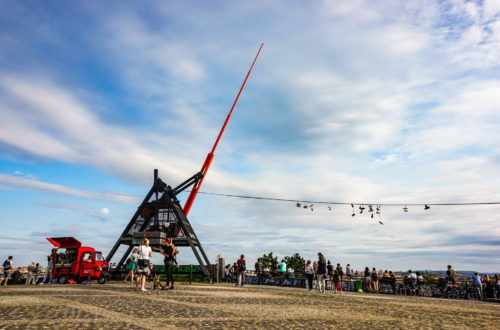 The statue has a kind of magical spirit and furthermore, you will have a great view of Prague from a different perspective. This walk is great in every season of the year and every time of the day. However, if you are a romantic soul, you will enjoy it particularly during the sunset. I believe you will love it. 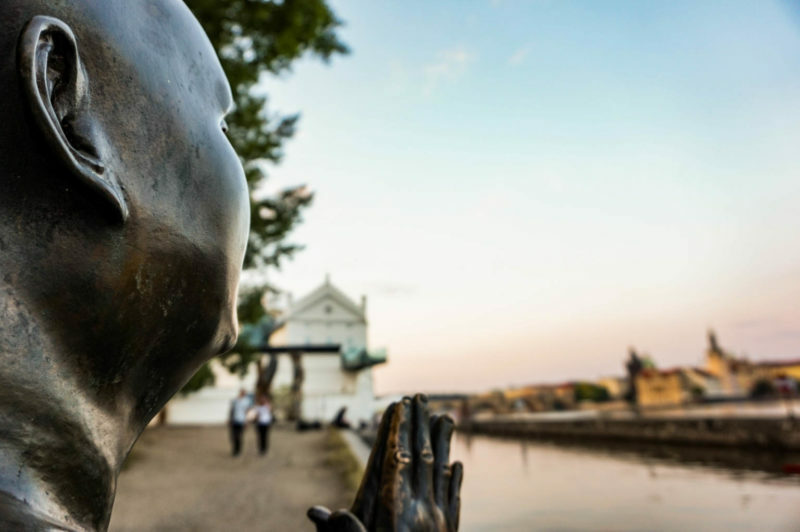 If you want to explore Kampa with all these highlights, start at Malostranska (metro or tram), have a walk according to plan and finish at Bridge Legií. 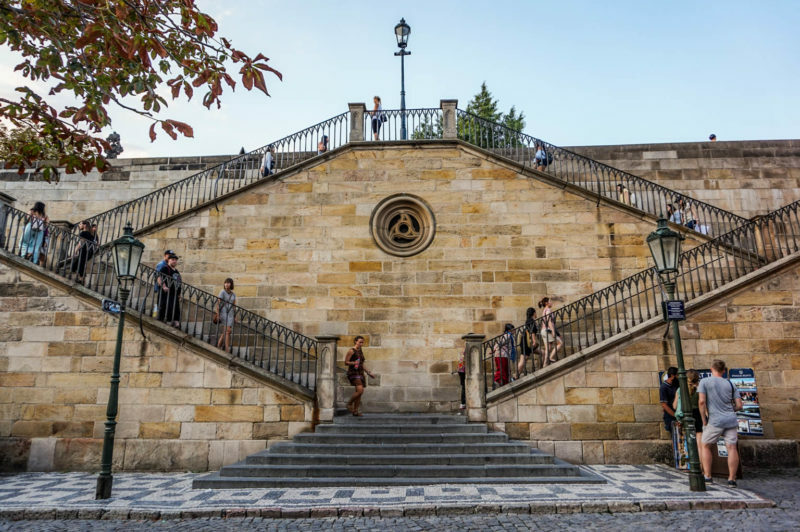 From there, you can take a tram from Újezd or cross the river by the bridge to the tram stop National Theatre.